Tehran Municipality has ordered the removal of new billboards bearing anti-U.S. slogans that appeared simultaneously citywide last week, official news agency IRNA reported on Saturday. 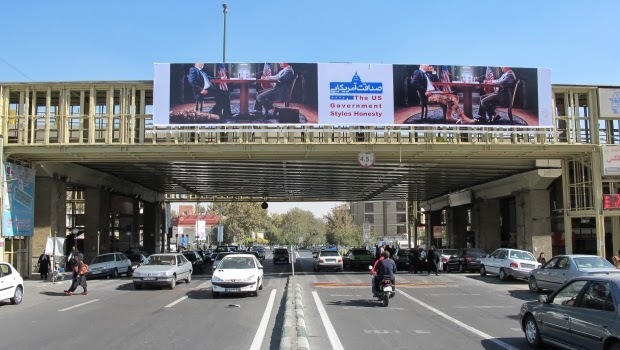 A spokesman for Tehran Municipality, Hadi Ayazi, said that a cultural institute had installed the new unauthorized billboards bearing anti-U.S. slogans without knowledge of the proper authorities. “In an arbitrary move, without the knowledge or confirmation of the municipality, one of the cultural institutes installed (these) advertising billboards," Ayazi said. The new anti-American posters were put up in busy Tehran thoroughfares since last week by Owj Cultural Organization. Today, Ehsan Mohammad Hassani, director of Owj, said his group had put up the posters with the permission of the municipality, semi-official Fars News Agency reported. Lurid anti-American graffiti and posters have adorned Tehran and other major Iranian cities for decades. The site of the former U.S. embassy in Tehran depicts the Statue of Liberty with a skull for a face. The removal of new billboards sparked protest from hard-liners. Kayhan, the influential newspaper of the hard right, criticized the decision in a Sunday editorial. Since Rouhani’s famous 15-minute phone conversation with Obama, and as Iran-U.S. relations show signs of improvement, the hard right has waged an anti-American campaign which included those billboards in Tehran and a contest to choose the best poster with “Death to America” theme. Iran-U.S. relations appears to be the main focus of the right in its campaign against Rouhani administration, with the rift between the radical right and moderates expected to grow as serious nuclear talks between Iran and the West get underway. A Wise man changes is mind ,bur the foolish wont!! The world's Zionist-commanded warmonger of the most arrogant, boastful and bully empire of the U.S. is indeed on the brink of bankruptcy, collapse and death. It's only time the most mattered. What a fact! mat, interesting that you made your comment after B.M.A. 's wise observation! And for thirty four long years it has been proven that the ones in charge in Iran are truly a foolish bunch indeed.